Welcome: "Yes! We Have No Bananas"
I remember hearing this song among Dad's collection of music. "Yes! We Have No Bananas" is a novelty song by Frank Silver and Irving Cohn from the 1922 Broadway revue Make It Snappy. Sung by Eddie Cantor in the revue, the song became a major hit in 1923 (placing No. 1 for five weeks) when it was recorded by Billy Jones, Arthur Hall, Irving Kaufman, and others. It was covered later by Benny Goodman and his Orchestra, Spike Jones & His City Slickers, and many more. It also inspired a follow-up song, "I've Got the Yes! We Have No Bananas Blues", recorded by Billy Jones and others in 1923.
we have a no bananas today. "Send me Pete and Nick and Jim; I need help right away"
We have no bananas today"
He, he, he, he, ha, ha, ha whatta you laugh at? You gotta soup or pie? Oh you've got a banana! Hey, Mary Anna, you gotta... gotta no banana? Now whatta you wanta mister? You wanna buy twelve for a quarter? 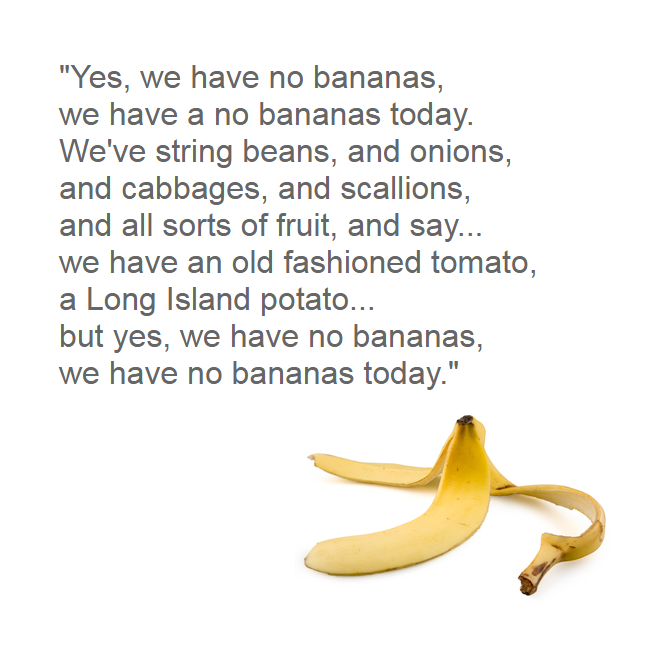 Yes, we gotta no bananas today! The afore-mentioned vegetable Bearing the cognomen "Banana"
Which we feel certain will tempt your pallet? Very delicious But we have no bananas today.